DETAILS: When her unit was ambushed in Iraq, this mother of two and American Indian soldier fought back, a congressman said. She was buried April 12 in the Hopi Reservation. (CNN) -- A gentle snow swept across Arizona's Painted Desert April 5, the same day the Pentagon announced the death of Pfc. Lori Piestewa. 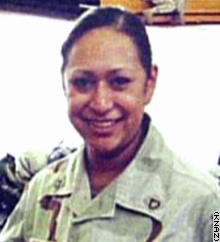 The soldier, a mother of two believed to be the first American Indian woman ever killed in combat, was the pride of the Hopi Indians living in Tuba City, Arizona. In this tightknit town of 9,000, the unseasonable flurry signified Piestewa's spiritual journey home. "In the Hopi belief, when one is deceased, they come back home. They visit the family, their community through the moisture," Hopi Tribal Chairman Wayne Taylor told reporters after the snowfall. "And this is what happened just a while ago. So I think we were blessed today." Piestewa went down fighting in the March 23 ambush of the 507th Army Maintenance Unit near Nasiriya, said Rep. Rick Renzi, R-Arizona, whose district includes Tuba City. Renzi said he spoke to two generals and a colonel who told him Piestewa was driving the truck that was transporting Pfc. Jessica Lynch and other soldiers. When the Iraqi soldiers attacked her convoy, Piestewa and the master sergeant riding next to her tried to hold the attackers back, Renzi said. "She fought. She drew her weapon and fought," he said. "It was her last stand. She fought and died valiantly with courage and honor." Nine soldiers, including Piestewa, died in the battle and Lynch was taken prisoner. When Lynch, Piestewa's friend and roommate at Fort Bliss, was rescued from a Nasiriya hospital April 1, Piestewa's body was among those found nearby by U.S. troops. Following in the tradition of her father, a Vietnam veteran, and her grandfather, a World War II veteran, Piestewa was commander of her high school ROTC corps. But her marriage her senior year in high school and the births of her two children prompted Piestewa to put her military plans on hold. Only months after her divorce, she reconsidered her military option and on March 30, 2001, she reported to basic training at Fort Sill. Her determination shone through in a local television interview before being sent to Iraq: "I am ready to go," she said, looking straight at the camera. "I learned to work with people. It's very important to me to know that my family is going to be taken care of." Thanks to donations from the public, a scholarship fund has been set up for Piestewa's children. First lady Laura Bush visited the young woman's family. And two Phoenix landmarks, Squaw Peak and Squaw Peak Freeway have been renamed Piestewa Peak and Piestewa Freeway -- a decision hailed by American Indian groups who consider the word "squaw" offensive. The "Lady Warrior," as her family referred to her, was buried April 12 in the Hopi Reservation, her brother, Wayland Piestewa, told reporters. "She is our hero," he said. "We are going to continue to believe that. We're going to hold that in our hearts forever. She will not be forgotten."